Jaina is a small island off the eastern coast of Mexico’s Yucatán Peninsula. Originally little more than an islet, legend has it that the ancient Mayans brought soil from the mainland over centuries, depositing it in the surrounding mangrove swamps to reclaim the land and make it into the island it is today. The Maya of Jaina were a fishing culture, as fish were plentiful here, and they also hunted manatee and other marine animals. They also grew crops and journeyed on both land and sea to trade a wide variety foods, objects and raw materials with nearby groups on the coast and further inland. They were highly skilled with a variety of raw materials, producing fine plates and mosaics with seashells, beautiful stone sculptures and bas-reliefs, and working with semiprecious stones. But their artistic legacy is based mainly on their pottery. The abundance of shards of polychromatic vessels indicates that they used ceramics extensively for both everyday and ceremonial purposes. 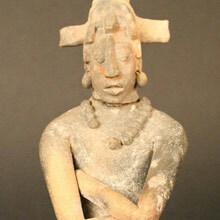 However, the most typical Maya Jaina ceramic items are their finely worked, highly detailed figurines. These pieces were modeled by hand or made in molds and, although usually very small, achieved a high degree of artistic expression, which can be appreciated in the variety of themes and superb attention to detail they displayed. Everyday activities, persons of authority, physical deformations, dwarfs, hunchbacks, men with swollen eyes and adolescents with distended stomachs are just a few of the subjects these artifacts displayed. Others were of local fauna such as lizards, bats, ducks and monkeys. 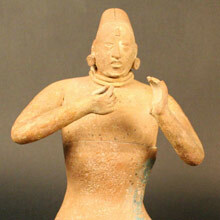 Many of these figurines are also whistles, flutes, rattles or containers, and some have articulated parts. The polychrome drawings on some ceramic vessels show individuals dressed in elaborate priestly attire. The figurines represent noblemen and elders in positions implying dignity and respect, priests in ceremonial garb with elaborate headdresses, ball players and individuals from a variety of social classes. 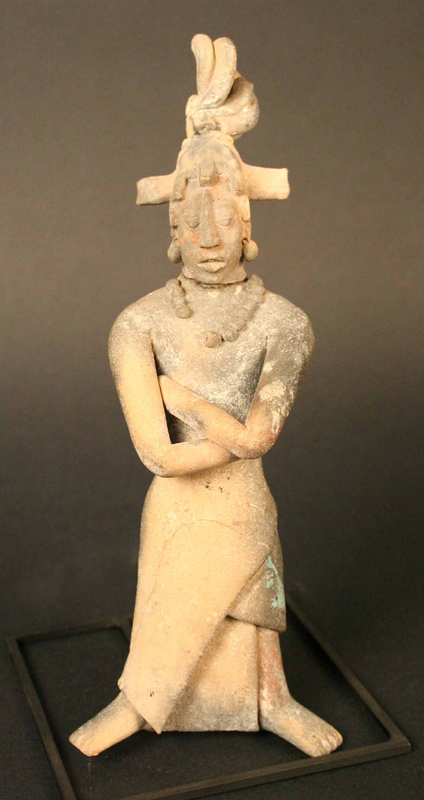 This evidence suggests that the Maya Jaina had a theocratic society governed by an elder leader with political, administrative and religious functions, who was advised and accompanied by a court of nobles and priests. Merchants, peasants, craftspeople and ball players would have served this ruling class. 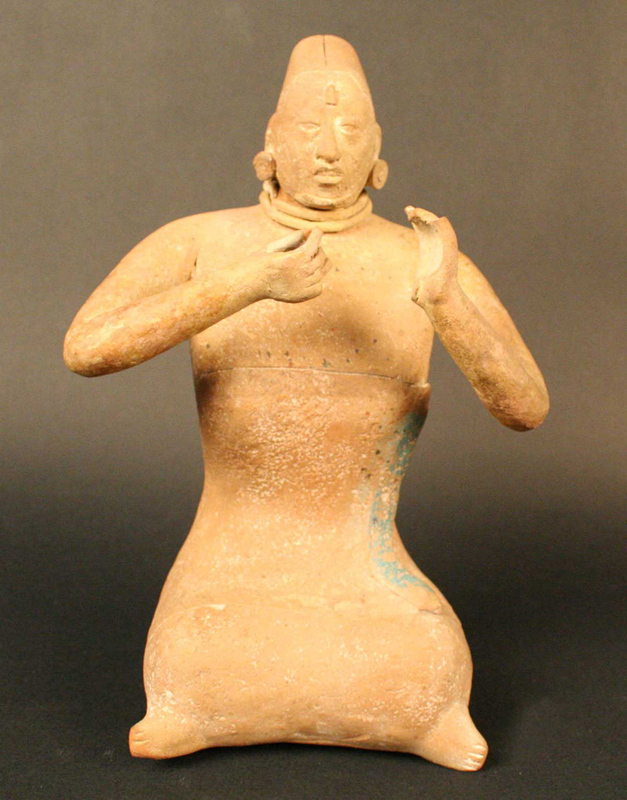 The religious practices of the Maya Jaina were probably very similar to those of other Maya peoples, which include a complex pantheon of gods, each with dominion over a specific aspect of the world. This religion would have been very visible in the social lives of these people, especially in the ways that rulers wielded their political and religious power. Over time, the strong ritual presence led to the island becoming a major necropolis in which the leaders of nearby settlements buried their rulers. Adults were buried directly in the soil, positioned with knees bent, wrapped in cloth and tied. Children were deposited in ceramic pots with grave goods deposited with them or beside the container. Generally, the bodies were sprinkled with cinnabar, the cranium was covered with a tripod plate, and jade was placed in the mouth. The array of grave goods that accompanied the dead included ceramic vessels and figurines and stonework such as ear and pectoral ornaments. The island seems to have been used as both a ceremonial center and as a base for fishing activities. The resident population was significant, and it seems that most activities were carried out on the island itself. Both the temples and residences were built with stone foundations that have withstood the test of time, though the little that remains of the rest of their settlements makes it difficult to envision how they lived. The Island of Jaina is close to the Mayan ruins of Uxmal, Labná, Kabáh and Sayil, making it likely that these groups were all in contact with each other. The presence of foreign raw materials such as serpentina, reinforces the idea of contact and exchange with other parts. At the time of European contact, Jaina was occupied and became one of 16 provinces under indigenous jurisdiction.